U.S. equity markets experienced a broad decline on heightened concerns of slowing economic and profit growth, rising wages and tightening monetary conditions. Persistent global economic weakness, Brexit delays and the protracted U.S. and China trade negotiations contributed to the pessimism. Stocks fell into negative territory with the Russell 1000 Value Index falling 11.7% and the S&P 500 Index declining 13.5%. Dividend growth stocks are often referred to as lower beta or lower volatility due to their above-average dividend yield and quality characteristics, which can be less reactive to market swings than their non-dividend counterparts. 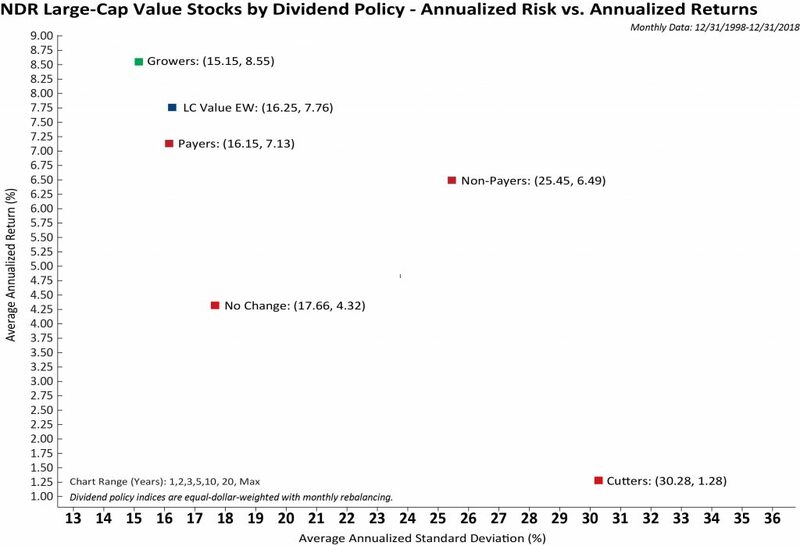 Over the long-term, lower volatility dividend growers benefited investors by outperforming stocks that have larger drawdowns and higher standard deviations (see chart below). The Navigator® High Dividend Equity portfolio has a historic beta of 0.76 versus the benchmark Russell 1000 Value Index of 1.0. According to Ned Davis Research, since the financial crisis in 2008, low volatility stocks’ risk adjusted returns outpaced those of high volatility stocks over the short, medium and long-term. In the final quarter of the year, the best performing sectors in the Russell 1000 Value Index were mostly defensive, including the Utilities sector (+1.0%), Communications (-5.65%), and Staples (-4.16%). The weakest sectors were comprised of trade and economically sensitive industries such as Energy, which declined 24.5%, and Industrials and Basic Materials, which were down 19.3% and 14.3% respectively. Top performing stocks for the quarter were Broadcom (+4.1%), Lukoil (-4.7%) and Aflac (-2.6%). The laggards in the portfolio included Regions Financial (-26.4%), Viacom (-23.3%) and SunTrust Bank (-23.8%). For the calendar year, the top sectors were Healthcare (+7.8%), Communications (+0.1%) and Technology (-1.4%). The worst performing sectors during 2018 were Industrials, which lost 18.9%, Energy, which lost 17.4%, and Materials, which dropped 17.1% compared to the index total return of -8.2%.